Mercy for Animals revealed an undercover video of five egg producing farms in three states that both McDonald’s and Target purchase from. Mercy for Animals had its people hired at Sparboe farms and wired them with hidden cameras from May 23rd to August 1st to document the animal abuse occurring. Sparboe Farms is one of the nation’s largest egg suppliers and has facilities in Iowa, Minnesota, and Colorado. Target Corp. was purchasing from the Litchfield Minnesota one and has now agreed to pull all eggs from this farm off its shelves. Target claims to have just been made aware of the facilities conditions and that is why they are immediately stopping their purchases. 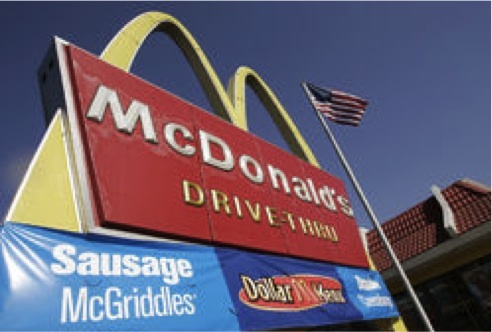 McDonald’s had purchased from the Vicent, Iowa plant for all its west locations and now says it will never work with Sparboe again. McDonald’s and Target released full statements on their decision to stop using Sparboe. Wal-Mart Stores Inc. have purchased from Sparboe previously and demanded more humane treatment. However, Wal-Mart stopped purchasing from Sparboe six weeks ago and claims it has nothing to do with their treatment of animals. The Humane Society (“HSUS”) has been able to convince many other fast food chains and businesses to stop buying at least some of their eggs from facilities that cage hens. These companies include Burger King, Costco Wholesale, Denny’s, Arby’s and Wendy’s Group. HSUS advocates for cage-free egg systems allowing hens to walk around and spread their wings. It also requests a “cruelty-free” facility for all egg-producing hens. After McDonald’s and Target decided to stop using Sparboe, the U.S. Food and Drug Administration (“FDA”) issued a warning letter to Sparboe’s Farms. They also found “serious violations” that are meant to prevent salmonella at five of their facilities. The FDA also found insanitary conditions due to contamination from filth, and health conditions from injuries. However, McDonald’s eggs were cooked properly, making them safe for consumption for their about 27 million customers a day. The FDA is making this one of its strongest enforcement actions since the outbreak of salmonella last year that affected 1,900 people and in which 550 million eggs were recalled. Sparboe produces over 300 million eggs a year at a rate of about 2 million a day, 7 days a week in one location. They claim to be the fifth-largest egg producer and marketer in the U.S. with seven processing plants that serve 26 states. The Mercy for Animals video showed workers swinging birds by a string tied to their feet, a mass amount of hens cramped into each individual small cage. It also showed male chicks being tossed into plastic bags to suffocate and workers cutting off the beaks of chicks. In 2004, People for the Ethical Treatment of Animals (“PETA”) released videos of KFC’s supplier slaughterhouse’s conditions, which discovered it a common practice to cut beaks of chicks without the use of painkillers and to keep them in small cages so they could not lift their wings. Why is this common practice still continuing if such large corporations stop purchasing from farms when they discover these conditions? Does consumer preference really create that much of a change, or do the companies really believe in stopping this treatment of animals? At Sparboe, one worker tried to shove a bird inside a co-worker’s pocket for fun, and another pressed his thumb against the back of a chick’s neck to break it. Sparboe states that it has a code to allow all employees to report to supervisors any abuses; however none were reported. Sparboe claims to have a “zero tolerance policy” for animal abuse. The farm also asserts it is “shocked and deeply disturbed” by the recently released video and has fired four employees over the incidents. They also claim to be retraining all “barn” workers in the proper procedures for animal care. Sparboe has hired a third-party animal welfare audit from Iowa State University as well. Mercy for Animals believes this is not going to stop McDonalds from purchasing from caged hen facilities. McDonald’s in Europe has switched to caged-free eggs completely, but it doesn’t seem the U.S. will change to this anytime soon. Can the report of undercover videos like this one into the public eye change the methods used on factory farms? Will the U.S. ever stop these practices all together through companies’ preferences? It seems doubtful, but this incident has brought conditions to the attention of a huge amount of consumers who are usually unaware of the conditions that take place and of what corporations purchase from these types of farms. Certainly this brings up the point of deception to consumers… When I was eating eggs I had no idea what the truth was and it would have made a huge difference to me decades ago as it did finding out 3 years ago.